Dried/calcined sludge & residues, prepared sweeps, some wet materials and lower grade metallics, are mixed with ashes and recycled dusts, and are smelted in a coke fired blast furnace. 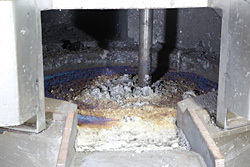 The blast furnace comprises a vertical, water-cooled shaft, into the top of which the silver bearing mix is charged. Recycled slag, flux, litharge and coke are also charged with the materials. Lead, in the form of recycled litharge, is used as the metal collector to form a lead-silver alloy. At the base of the furnace is a brick-lined removable crucible from which slag and metal alloy are continuously separated. Oxygen-enriched air is blown in close to the base of the furnace and this provides the high temperature combustion of the coke necessary for smelting. 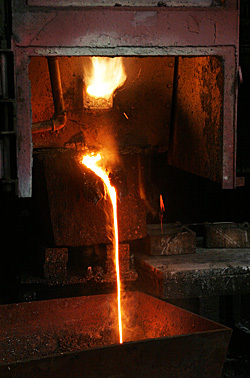 The furnace operates with the smelting zone at ~1400°C. The hot exhaust gases pass up the furnace, through the charge material and, by direct heat exchange, pre-heat the charge materials. Dust and fume are captured by a dry, fabric bag filter plant before discharge through a 55 metre stack to atmosphere. Particulate emissions to atmosphere are continuously monitored and with routine gas and metal emissions monitoring conducted as required by our environmental operating permit. Dusts from the filter are collected into stirred mixing tanks and, by the addition of water and lime, halides are converted to soluble calcium salts. The insoluble heavy metal compounds are separated by filter press and are recycled to the blast furnace. The solution containing the soluble halide salts is removed from site by tanker and treated by an authorised waste contractor. 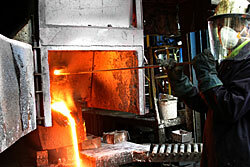 JBR also periodically uses its blast furnace to convert waste lead materials to unrefined metallic lead. Silver-free materials such as lead drosses, litharge, dusts, foils, lead foil paper and other lead materials are smelted to produce unrefined 99%+ lead blocks, which are subsequently shipped to a UK lead refiner for refining to 9999 lead bullion. 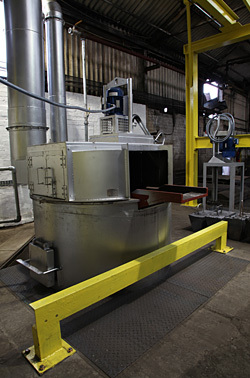 JBR also employs a small 5 tonne capacity lead refining kettle, which utilises the Parkes Lead Refining Process, to periodically separate Ag and other contaminant metals, such as copper, from JBR lead bullion, to produce 999 lead blocks.